Starting on December 1st (and often even earlier), every platform across the board begins cranking out their Christmas movies for families to devour over and over for the next 25 days. From Netflix and Amazon Prime to the Hallmark Channel and Lifetime (Grumpy Cat, anyone?) the viewing options can get overwhelming. But don’t worry, your hot chocolate won’t get cold while you waste hours searching through the endless titles available, because I’ve got you covered. Just grab that blanket, plug in that tree to set the mood, and use this guide to the best Christmas movies available to stream on Netflix. 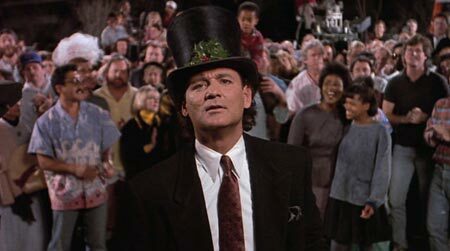 This completely absurd, fantastical comedy, loosely adapted from Dickens’s A Christmas Carol, would be a total flop if it featured anyone other than Bill Murray. But somehow, some way, he manages to make this film one I can’t seem to turn off once I start watching. Murray stars as Frank Cross, a TV executive who has no lines he won’t cross when it comes to finding ways to boost his ratings. The sarcastically dark humor and Murray’s character’s overtly sadistic nature results in a drastically exaggerated take the traditional story, but it’s worth the watch to witness Murray’s antics and the extensive list of celebrity cameos. If you like your Christmas movies to give you the warm and fuzzies and fill you with the spirit of Christmas, then go ahead and move on to the next spot on the list. But for those of you who prefer your Santa Claus with a little bit of alcohol on his breath combined with a plethora of F bombs, then Bad Santa is the holiday film for you. Billy Bob Thornton as Santa and Tony Cox as his partner and elf, Marcus, manage to bring out the grouchy Grinch in all of us. Although Bad Santa never quite turns into the redemption story one might expect, it creates a new kind of Christmas story that will warrant a space on your shelf for when you need a good, bitter laugh. 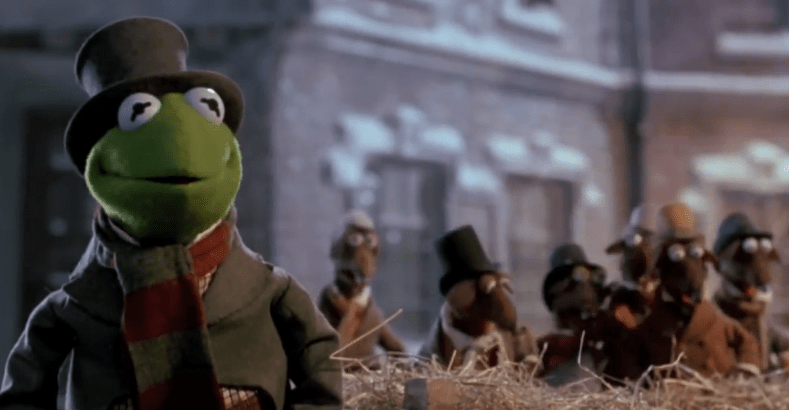 This light-hearted, music infused retelling of the famous Charles Dickens classic was the first Muppet’s film created by Brian Henson following his father’s death. If that’s not enough to make it worth the watch, I have two words for you: Michael Caine. If nothing else, watch The Muppet Christmas Carol for the sheer experience of witnessing Caine as Ebenezer Scrooge. The Christmas cheer spread by the muppets in this version of A Christmas Story is the perfect way to set the mood for the season, and as a musical that actually closely follows the original story, it’s a great opportunity to expose young children to this timeless tale. No bah humbugs about this one. The undeniable charm and endearing sentimentality that surrounds Love Actually has been largely forgotten over the years since many failed attempts have been made at recreating this take on the romantic comedy that weaves the eventually intersecting stories of an ensemble full of heavy hitters (think New Years Eve, Valentine’s Day). But this borderline cheesy, love obsessed holiday film is able to rely on its irresistible cast and the potential for our hearts to turn to mush during the holiday season to completely win us over. When it comes right down to it, aren’t we all dreaming of a white Christmas? This timeless classic featuring Bing Crosby as one half of the singing duo that falls in love with a pair of performing sisters as they team up to save a failing inn in Vermont. They joyful, whimsical performances, and the timeless soundtrack make this a Christmas classic that deserves a rewatch every year. This is one of the sweetest movies ever made, and during this time of year, what else matters more than pure glee and feel good entertainment? That makes for a Merry Christmas indeed. Beth is a lover of binge-watching, superheroes, and all things sci fi. She currently resides in the greater Pittsburgh area.